The Williams brother screen writers, Harry and Jack, said they were skipping off to the pub on Monday night – avoiding questions about which of their competing thriller series to watch – Liar on ITV or Rellik on the BBC. Film officers, residents and council workers across London who’d played their own small roles in each drama had to make similar choices. FilmFixer runs the film office service for boroughs featured in the dramas including Haringey, Islington, Camden, Southwark, Lambeth, Lewisham, Bromley and Croydon with some unit basing at Valentine’s Park in Redbridge. Two Islington Council crematorium staff in particular will be looking out for Rellik’s episode three – because they appear in it. FilmFixer director Andrew Pavord explains, “The production used Islington&Camden Crematorium in East Finchley for a scene with one of the lead characters, Elaine Shepard, who’s played by Jodi Balfour. “She’s visiting the crematorium to bid her dead father goodbye, all alone except for crematorium staff, played by two real Islington Council staffers. This week’s first episode saw co-star Richard Dormer as Gabriel Markham, sweeping away the pebbles on a grave to grab a pill bottle. 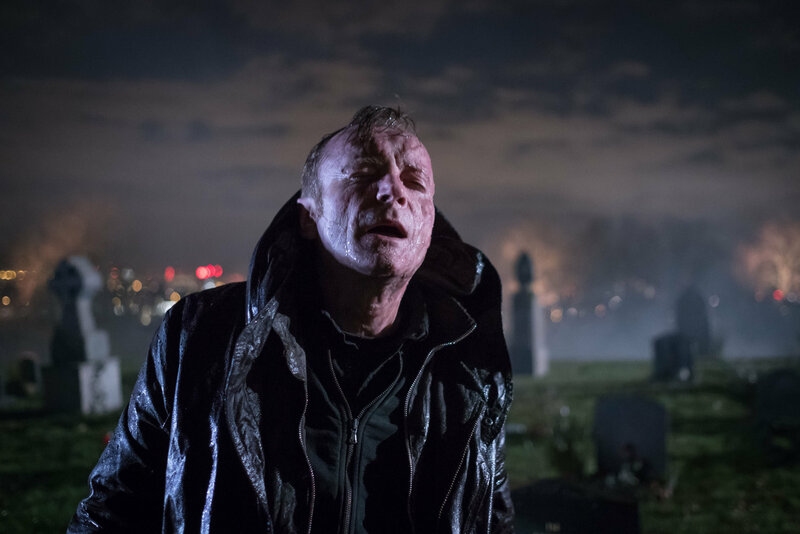 The stormy sequence was shot outside Alexandra Palace in Haringey, with gravestones set against the hill overlooking panoramic nighttime views of London. Haringey also provides therapist Isaac Taylor’s home on Sheldon Avenue, Highgate. Taylor’s habit of carrying surgical gloves makes him a highly suspicious character. Inside Haringey’s Old Hornsey Town Hall, sets were built to create a flat in which a crime is committed. Character Patrick Barber (played by Paul Rhys), the charming, suave yet highly immoral management consultant is seen packing his bag and cleaning, ready to hightail it. In another scene, the exterior of the town hall hosts an inferno – as the building catches fire, with police cars pulling up and officers heading inside. Back in Islington, a Dingley Place home was used as Elaine’s flat and other exterior shots. Among other scenes, police break down the door to do a search. Islington also enabled a massive two-day shoot at the Metal Works on Torrens Street, where 300 cast and crew filmed a rave. And the studios at the former Central St Martins on Southampton Row in Camden were used for the detectives’ office scenes as well as hospital scenes. Although Liar is set on the Kentish coast in Deal, the production also used south London locations within easy reach of Kent, in Bromley, Croydon, Lewisham, Southwark and Lambeth. In Southwark’s Peckham Rye Park a character sits on a bench by the lake feeding ducks, until a park officer arrives on a quad bike telling him not to. The Waverley Arms in Southwark’s Nunhead hosted filming over three separate days. Joanna’s restaurant in Croydon’s Crystal Palace was used twice. A home on Breakspears Road in Lewisham is raided by armed police. More Lewisham homes in Whitbread Road, Longton Avenue and Mantle Road, were used, along with Noak cafe on Mantle Road. In Bromley a character walking along Martin’s Road is stopped by police for questioning. Outside the Shortlands Tavern on Station Road a character chats on their phone before heading back inside. And we see characters meeting up on Lansdowne Place. “The film makers worked extremely well with locals,” Andrew Pavord says. “They provided blackout material to residents who needed it for keeping out the extra lighting of a night shoot. And they made some lovely donations to groups, including Longton Avenue Residents Association security gate fund, Brockley Society for Breakspears Road, Go Film It Academy in Lewisham and the Bromley charity JusB.